I think the underlying problem that banks are dealing with is that too much of their retail customer revenue is hidden – that is, their customers don’t know they are paying it. It seems to me that you really don’t have a customer unless the customer is making a conscious decision to pay you. Otherwise, you have some other kind of business – sort of like a trading business. There’s nothing wrong with that as a business – the problem is that if you fool yourself that your customer is “buying” your business, then your management framework is going to get seriously out of line. 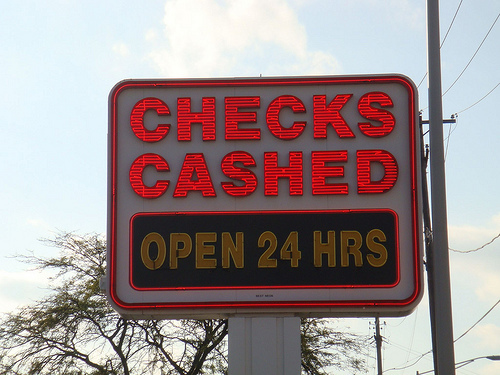 According to the study, concern about bank fees such as overdraft or monthly fees, is the main reason unbanked residents do not use banks or credit unions. This is a somewhat ironic development, considering that, according to the study, residents in just two New York City neighborhoods ” Jamaica, Queens, and the Melrose section of the Bronx — spent more than $19 million a year on check-cashing fees. But speakers at the forum emphasized just how extensive distrust of traditional financial institutions continues to be. Now, let’s look at these two posts for a moment. One one hand, you have “hidden income” because customers don’t realize how they’re helping their bank/credit union make money. On the other hand, you have potential customers that avoid banks/credit unions because of this hidden income. Customers that go to check cashing or pay day lender businesses aren’t upset by the fees because they know what they’re paying upfront. Banks and credit unions list their fees in handy-dandy brochures and disclosures. What’s interesting is, the conclusion in the BS&T post is offering an account that “for the first two years, includes no overdraft fees, no monthly fees (provided minimum balances are met), minimum balance requirements of $25 or less, and an ATM card”. Is it me, or did they just completely miss the point? And why the heck do they only offer an ATM card and not a debit card? There is no overdraft protection, so the transaction would be declined. Customers, potential or current, don’t particularly want to deal with the whole “hidden fees” that are attached to accounts. There’s a reason Congress is making overdraft opt-in now. What exactly is wrong with charging fees for services instead of “whoops fees” anyway? The alternative lending industry seems to be making money hand over fist, all because they post their fees and services front and center when you walk in the door. I wonder how much the banking industry would change if they posted their fees up front and actually charged for their services? None of this silly fee schedule only in the brochure/disclosure stuff. No one reads that stuff anyways, and customer complaints about fees prove that. I never thought I’d say it, but I miss the days before free checking. Granted, I hated paying a monthly fee for my checking account, but it made me a better manager of my money. I also made sure I did the correct things in order to avoid that fee. So maybe we need to get back to the days of charging a monthly fee and doing like Bank of America and drop overdraft protection altogether. Terence Roche has a great post on Gonzobanker about retail account analysis. I think this is the direction we need to be heading in. Being upfront and charging for services is one of the best ways a bank/credit union can survive this current crisis. But then, that’s too much like right.